July 27 – August 17, 2019; Dluzew, Poland. A 21-day Chan meditation retreat, led by Ven. Chi Chern Fashi, will take place in August 2019, at the Plein-air House of the Warsaw Academy of Fine Arts in Dluzew, Poland. The retreat will begin with a Dharma talk by the Master at 7 pm on July 27 and will end at 10 am on August 17 (Saturday). The Master will be accompanied by a teacher Ven. Guo Yuan Fashi. The prerequisites for acceptance to the retreat are at least 6 months of experience in Buddhist meditation practice and participation in at least one intensive (i.e. at least 5-day) retreat. 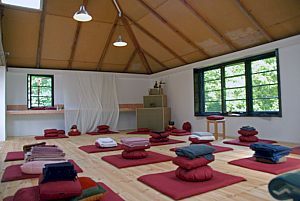 It is possible to participate in 7, 14 or 21 days of the retreat, providing one begins on July 27.